Ah, 2013, the year that the Mayans thought wouldn't exist. Fortunately, we're all still here and this year is already shaping up to have some marked events. Astronomers are on the lookout for the brightest comet seen in many generations, gamers are eagerly anticipating the release of the Xbox 720 and Playstation 4, and the whole world will be on pins and needles waiting for the first glimpse of William and Kate's baby. Unfortunately, 2013 could also represent the strongest nationwide outbreak of influenza in a decade — and experts say the season is only getting started now. Even worse, now that holidays are winding down, infectious disease experts expect another surge following the family get-togethers with all the sharing of food and affection. What a way to head into the New Year, right? Fortunately, there are companies that care and want to help. The most recent partnership that I have learned about is Vicks teaming up with the non-profit charity Baby Buggy (founded by Jessica Seinfeld) and the promise to distribute $25,000 worth of cold and flu products to U.S. families in need. Along with all of their high quality, convenient and safe products that can help keep your family healthy or make them feel better, Vicks also has a Cold & Flu Survival Guide that can help us make it through this season of sniffles and coughs. Filled with great tips from pediatrician and American Academy of Pediatrics fellow, Dr. Jennifer Trachtenberg, this Guide just might help us make it through to spring without finding ourselves laid up in bed with the flu. First, for every email, Facebook, Twitter or Pinterest share of the Cold & Flu Survival Guide, Vicks will donate a Vicks Behind Ear Thermometer and Starry Night Humidifier to Baby Buggy (which is dedicated to providing U.S. families in need with essential items for their children). With the quick links right on the side, sharing of the Guide couldn't be much easier — as well as for a better cause! Second,Vicks wants to help your family as well. Everyone who visits their Cold & Flu Survival Guide can easily sign up to win their own Vicks Starry Night Humidifier simply by entering their name and email address between now and March 1, 2013! Be sure to head over to the Vicks Cold & Flu Survival Guide to support this wonderful initiative as well as sign up to win one of these functional and fun humidifiers! 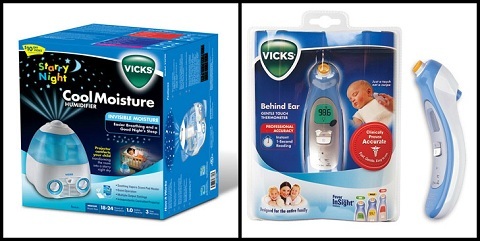 Vicks Behind Ear Thermometer V980 (ARV $49.99)! A big thank you to Vicks for providing a Behind Ear Thermometer for one lucky giveaway winner. The opinions shared are my own and honest and if you really need to see more, click here to see how I roll. Getting hands clean requires washing them with warm water and soap for at least 20 seconds! You can temporarily cool off the body by using a cool washcloth on the forehead or taking a tepid or lukewarm bath. I learned that staying hydrated is always important! staying hydrated is always important, it's especially critical if you feel a cold coming on. When you have a fever, taking a luke warm bath can cool you're body temporarily. My son would love the stars the Vicks Starry Night Humidifier projects on the ceiling. heehee, thats what we already do. the happy birthday song. staying hydrated isimportant in staying healthy. staying hydrated is the most important thing when you are sick. I learned Water, along with other non-caffeinated liquids, help loosen congestion. I actually am a nurse and already knew this stuff. But, enjoyed reading it! I also already knew all of this for I am a CNA.... but I always have enjoyed reading Blogs...I have learned so much that I didnt know!! Thanks for ur hard work!! Water and other non-caffeinated liquids help to loosen congestion. I knew that when you have a fever a cool washcloth on the forehead helped, but I never thought about taking a lukewarm bath. Good idea! use a cool washcloth on your forehead and/or take a lukewarm bath if you have a fever. fever is one of the first signs of business. It's important to wash your hands often. I didn't know water helps break up congestion. I learned that if you have a cold coming on it is very important for you to drink a lot of water! I learned water helps loosen congestion. To be honest, I really didn't learn anything new. i learned about the starry nights humidifier, how not only does it do its job but it also projects stars on the ceiling. Wash hands for at least 20 seconds and stay hydrated. Visited and learned Fever is often one of the first signs of illness. You can temporarily cool off the body by using a cool washcloth on the forehead or taking a tepid or lukewarm bath. I learned that Fever is often one of the first signs of illness. You can temporarily cool off the body by using a cool washcloth on the forehead or taking a tepid or lukewarm bath. I learned the difference between a humidifier and a vaporizer! the Vicks Starry Night Humidifier not only adds moisture to the air, it also projects stars on the ceiling. Take a bath to cool down a fever. I learned you can temporarily cool off the body by using a cool washcloth on the forehead or taking a tepid or lukewarm bath. I learned that Water, along with other non-caffeinated liquids, help loosen congestion. I learned staying hydrated is especially important if you feel a cold coming on. I learned that taking a lukewarm bath will help a fever. That you should sing 2 renditions of Happy Birthday, not 1, when you wash your hands. Stay hydrated, keep hands washed. I learned that hydration is very important, especially at the onset of a cold. I learned how important it is to stay hydrated...Water, along with other non-caffeinated liquids, help loosen congestion. I learned that to temporarily cool off the body by using a cool washcloth on the forehead or taking a tepid or lukewarm bath. You should wash your hands for about 20-30 seconds which is about 2 times of singing Happy Birthday. the right temp bath is very useful to lower high fevers... time-honored, this is, it is what I was taught to do by my mother! I'm a nurse so I knew about the handwashing, staying hydrated, etc, but I did learn that Vicks has a Starry Night Humidifier that projects stars onto the ceiling-CUTE! I learned that You can temporarily cool off the body by using a cool washcloth on the forehead or taking a tepid or lukewarm bath. 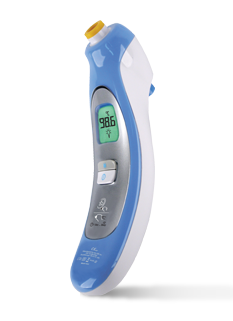 I learned that this thermometer is a great, non-invasive alternative which takes quick 1-second temperature readings near the carotid artery located behind the ear lobe. Vicks Starry Night Humidifier add moisture to the air helping to keep little noses clear, it also projects stars on the ceiling. You are supposed to sing twice. I learned that staying hydrated is the most important thing to do when you're sick! I learned "Though staying hydrated is always important, it's especially critical if you feel a cold coming on. Water, along with other non-caffeinated liquids, help loosen congestion." If you have a fever, You can temporarily cool off the body by using a cool washcloth on the forehead or taking a tepid or lukewarm bath. Hydration is important and drinking non-caffeinated liquids is good! Humidifiers help relieve your cold and flu symptoms when you or your family are sick and also help to reduce the number of influenza germs in the world around them. You should wash your hands for at least 20 seconds with warm soapy water to get them really clean. You can cool off by using a cool washcloth on the forehead or by taking a lukewarm bath. I learned that staying hydrated is critical. I learned that drinking plenty of water, along with other non-caffeinated liquids, help loosen congestion. Thanks for the chance to win! I didn't know that making sure that you're hydrated helps fight off illness as well. Water and other non-caffeinated liquids help to loosen congestion. Thanks so much for the fantastic giveaway and happy New Year! Getting hands clean requires washing them with warm water and soap for at least 20 seconds – that's about 2 renditions of 'Happy Birthday'. I learned about the importance of drinking lots of water and staying away from caffeine. Water helps to loosen congestion. Good to know. I think I'll switch out my Coke with a Vitamin Water. Here's something I read that I did not know, and I find it very useful! "Water, along with other non-caffeinated liquids, help loosen congestion." Water, along with other non-caffeinated liquids, help loosen congestion. Drink plenty of liguids; stay hydrated. I learned that washing hands should be 20 seconds! Luke warm baths help lower temp. Water helps in loosing congestion and wash hands good. I learned that water, and other non-caffienated beverages, helps to loosen congestion. Hydration is critical during a cold. I learned you can temporarily reduce a fever with a cold wash cloth or a lukewarm bath! You should stay hydrated with water. I am a nursing student, and so I knew the facts on the page. Those facts are important, and I am glad that they are being promoted to the public. Hand hygiene, in particular, is a very important way to decrease the spread of infection. I discovered that water and other non-caffeinated liquids help to loosen congestion. I didn't learn anything I personally did not already know, but I think they have a well written, concise list and I am happy to help spread the word! We can all use the "At least 20 seconds" hand washing reminder occasionally. I learned getting hands clean requires washing them with warm water and soap for at least 20 seconds. I learned that it is important to stay hydrated because water helps loosen congestion. Learned I could enter to win a humidifier - so I did. learned about their starry night humidifier - so cute! I learned that the new behind ear thermometer only takes one second to get your temperature - so much faster for wriggly, sick kids! The time it takes to sing 'Happy Birthday' twice, is how long you should be washing your hands. I learned that to get your hands clean it requires washing them with warm water and soap for at least 20 seconds my son has a problem with this one! I learned that getting hands clean requires washing them with warm water and soap for at least 20 seconds! I didn't know that water helps loosen congestion! I learned that Vicks makes a humidifier with a nightlight in it. I learned that non-carbonated liquids help loosen congestion. Hydrate with non-caffeinated beverages when you feel a cold coming on. I found out that you have to wash hands for 20 seconds - or as long as it take to sing "Happy Birthday" song twice. It takes 20 seconds to get hands clean. This helps reduce the spread of colds and flu. Also staying home when you know your sick can help reduce the spread of viruses. Humidifiers Reduce Survival of Flu Viruses on Surfaces and in the Air. When you have a fever, taking a warm bath can temporarily cool your body. I learned fever is one of the first signs of illness. The site reminded me how important hydration is. Staying hydrated is so important. Not only does the Vicks Starry Night Humidifier add moisture to the air helping to keep little noses clear, it also projects stars on the ceiling. I learned that "humidifiers add moisture to the air helping to keep little noses clear"
I learned that you can take a lukewarm bath to cool off the body when you have a fever. I never knew water loosens congestion. Drink, drink and drink some more! I learned that you have to sing Happy Birthday 2 times through to properly wash your hands! I learned water helps with congesstion. Wash hands for at least 20 seconds. I did not know to sing Happy Birthday twice is about the right amount of time. Wash your hands (sing happy birthday twice) and drink water to stay hydrated. I learned that 2 renditions of 'Happy Birthday' is how long you should wash your hands for. I knew most of these things for not getting sick. Cooling off with a bath or drinking plenty of water. I've never paid attention to how long I wash my hands, but I will now. To sing Happy Birthday two times is an easy way to ensure a thorough cleansing that will help to prevent the spread of a cold and/or the flu. You need to wash hands for 20 seconds to get them clean.